John Woods is Director of The Abductive Systems Group in the Department Philosophy at the University of British Columbia and The UBC Honorary Professor of Logic. From 2000 to 2012 he held the Charles S. Peirce Professorship of Logic in the Group on Logic and Computational Sciences, Department of Informatics, King’s College London. John Woods graduated with a B.A. and M.A. in Philosophy from the University of Toronto, and completed his Ph.D in Philosophy under Arthur Burks at the University of Michigan in 1965. He holds an LL.D honoris causa from Mount Allison University and a D.A. honoris causa from the University of Lethbridge. Fellow of the Royal Society of Canada, he is also a recipient of the Queen’s Golden Jubilee Medal and the Alberta Centennial Gold Medal. 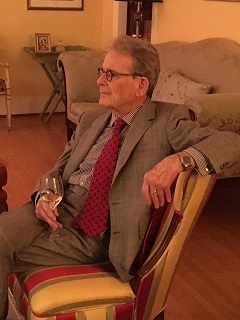 He is a Life member of the Association of Fellows of the Netherlands Institute for Advanced Study, and President Emeritus of the University of Lethbridge, where he is also Adjunct Professor of Philosophy. John Woods has held regular or visiting appointments at the University of Michigan, the University of Toronto, Stanford University, Laurentian University, University of Victoria, the University of Calgary, the University of Lethbridge, the University of Amsterdam, the University of Groningen, King’s College London and Sun Yat-sen University. He was Dean of the Faculty of Humanities at the University of Calgary from 1976-1979 and President and Vice-Chancellor of the University of Lethbridge from 1979-1986. Current interests include, naturalized logic, abductive logic, logics of practical reasoning, fallacy theory, conflict resolution strategies, the logic of legal reasoning, the logic of fiction, the logic of model-based reasoning, the logic of error, the logic of inconsistency management, and the history of logic. His most recent monographs are Errors of Reasoning: Naturalizing the Logic of Inference, volume 45 of the Studies in Logic series, London: College Publications, 2013, ISBN-10: 184901143; Aristotle's Earlier Logic, 2nd edition expanded and revised, volume 53 of the Studies in Logic series, College Publications, 2014, ISBN 9781848901643; and Is Legal Reasoning Irrational? An Introduction to the Epistemology of Law, volume 2 of the Law and Society series, London: College Publications, 2015; ISBN 97184901629. All available from amazon.com and most other Amazon sites. The Death of Argument: Fallacies in Agent-Based Reasoning, Dordrecht and Boston: Kluwer 2004, ISBN 1-4020-2663-3.
. Originally published in 1974. Fictions and Models: New Essays edited, with a Foreword by Nancy Cartwright, London: College Publications 2010. ISBN 978-3-88405-099-6. All these works but the last are available from amazon.com, amazon.ca and most other Amazon sites. Implication, Inference and Argument: A Fraught Trinity, scheduled for 2016. Reorienting the Logic of Fiction: Sherlock's Member and Other Notable Parts, scheduled for 2017. The Logic of Making Things Up: An Essay in Paradigm Creep. Does Changing the Subject From A to B Really Provide an Enlarged Understanding of A? How Robust can Inconsistency Get? John Woods is Editor, with Dov Gabbay, of the eleven-volume Handbook of the History of Logic, published by North-Holland; Editor, with Dov Gabbay and Paul Thagard, of the sixteen-volume Handbook of the Philosophy of Science, also published by North-Holland; Editor, with Dov Gabbay, Joerg Siekmann and Johan van Benthem, of the monograph series Logic and Cognitive Systems, published by College Publications: Editor, with Trevor Bench-Capon, P.M. Dung, Marcello Guarini, Ulrike Hahn and Fabio Paglieri, of the monograph series Studies in Logic and Argumentation, also appearing with College Publications; and Editor, with Frans van Eemeren, Scott Jacobs and Erik C.W. Krabbe, of the monograph series Argumentation Library published by Springer.